I made this rug for the Portland Handweavers Guild guild booth in the 2017 ANWG Conference. Our booth theme is recycle/reuse, and guild members were asked to include a story about making the piece to include in the booth. Here's the story! In 1993, PHG offered a 3-day workshop in ply-split braiding with Peter Collingwood, and I've been experimenting with this obscure textile technique ever since. The first step is to make plied cords, and then cords are pulled through other cords to create flat and 3-D objects. 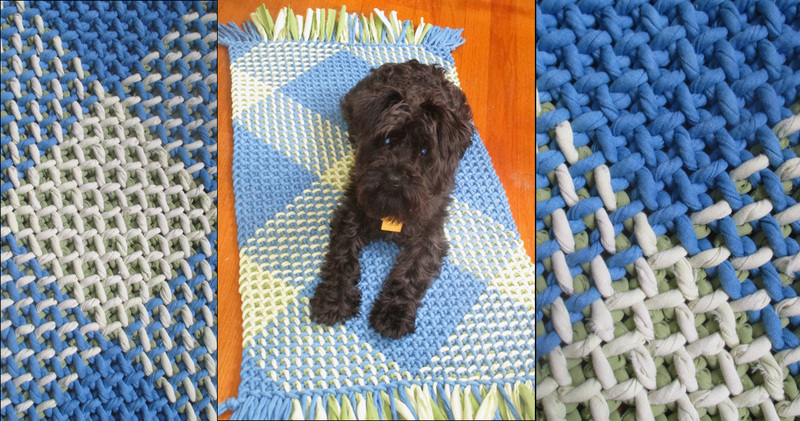 I wanted to ply-split a special mat for our new rescue dog, Pepper, using cords made from recycled fabric strips. Pepper had been picked up as a stray, spent some time in a shelter in Merced, California, and then was trucked up to Portland, where we found her at the Oregon Humane Society. She's a beautiful 10-pound ball of energy, and very smart, but is afraid of many things, and barks a lot, especially at other dogs and my husband. We're having a dog trainer come to our house to help us, and one the trainings we're working on is called "Relax on a Mat". The fabrics I used in the mat have been in my studio for 15-20 years. The blue fabric is from a partial bolt of knitted fabric that had been damaged when it fell off a truck. I dyed the fabric blue and had cut some of it into strips to use as weft for two kitchen rugs. The yellow and avocado fabric are sheets from Goodwill. I used up every bit of these fabrics, cutting the knitted fabric with my serger (needles removed), and tearing the other fabrics into 1-1/2" strips. Then I used my 4-hook cordmaker attached to an electric drill to make 2-ply cords. The structure of the mat is plain oblique twining using the 2-ply cords with a full twist between the splittings. This produces a structure that has a "waffle" appearance, and where I have used 2-color cords, the yellow is dominant on one side and the avocado on the other. I finished the mat by pulling the working ends through a cord on each end, and then unplied all of the cords for fringe. This page created on June 24, 2017.